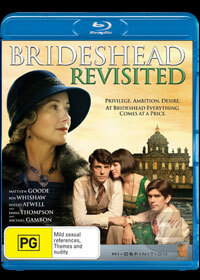 Brideshead Revisited is based on Evelyn Waugh’s famous novel from 1945 and has been adapted previously as a successful BBC TV min-series. I have not seen the series, but like other seminal novels adapted into a two hour film (the Keira Knightley Pride and Prejudice comes to mind), this adaptation feels too compressed and disjointed, especially in its second half. Set in the mid 1930s, we meet the affable Charles Ryder (Matthew Goode), an Oxford University student who meets the liberal Sebastian (Ben Whishaw). Charles is quickly charmed by his rebellion against Oxford tradition and, especially, that of his Catholic family who reside at the Brideshead Estate. Their relationship, which verges on a romance, becomes obvious to Sebastian’s sister, Julia, who is likewise infatuated by Charles. Despite Charles’ increasing interest in her, she feels such as relationship would be inappropriate in view of her Catholic faith. This dynamic between the aristocratic Catholic family and non-believer Charlie forms the basis for the rest of the film which spans a ten year period. The great Emma Thompson plays the fiercely religious and controlling mother, Lady Marchmain, with a singular vision for her children. She is contrasted by their father, played by the always entertaining Michael Gambon, who lives in Venice with his mistress. The early scenes between Charlie and Sebastian are rebelliously compelling: they line up bottles of wine and taste them one by one, swim naked in the fountain and generally buck authority. The love triangle that emerges with Julia is engaging, and then one character disappears and the drama evaporates. Too many of the later scenes involve unsubtle arguments about theology (though they don’t have a shade on the gems in Angels and Demons) and Charlie feels more like a bland pawn in Lady Marchmain’s game than an interesting protagonist. The disc itself is adequate, with a choice between DTS-HD 5.1 and Dolby Digital 5.1 Surround, but no special features. The video is crisp, bringing out the details of the dimly light and monochromatic mansion and its lush surrounds; the menus are simple and functional. This adaptation simultaneously aspires to be a critique and by the end, an endorsement, of Catholicism. While succeeding as a modest critique, any affirmation of the faith represented by character choices late in the film feel contrived, possibly a victim of the necessarily truncated adaptation. It’s worth noting that Evelyn Waugh was a Catholic convert, and may have been none too pleased that his work was turned into more a of a criticism of his faith – albeit a mediocre one – rather than a cautious affirmation.